We are rarely posting to this blog at this time, since THE NEW SOCIAL WORKER's main site was upgraded last fall. Most articles from the magazine, as well as new blog posts, are now posted directly on the magazine's site. To be sure you don't miss anything, you can subscribe to the feed of the new site here. Fall 2013 issue of THE NEW SOCIAL WORKER is available now! As we continue our 20th year of publication of THE NEW SOCIAL WORKER magazine, exciting things are happening! First, I want to thank all of our subscribers to THE NEW SOCIAL WORKER's free electronic edition. The Fall 2013 issue of The New Social Worker magazine is now ready to download! It is available, free of charge, in PDF format, directly from The New Social Worker Web site. THE NEW SOCIAL WORKER magazine and SaraKay Smullens' article on burnout and self care in the social work profession received the 2013 NASW Media Award for Magazine/Magazine Article. SaraKay and I will be at the PA NASW conference next week to accept the awards. I hope to see some of you there! For this Fall season, Karen Zgoda and I put together THE NEW SOCIAL WORKER Magazine's Back-to-School Guide for Social Work Students. This guide is a collection of articles from the magazine that will help students succeed in the new academic year, mixed with back-to-school tips from a variety of social work experts. The guide is available in e-book formats only at Amazon.com (Kindle edition) and Smashwords.com (ePub and other formats). A new book for your wish list! BEGINNINGS, MIDDLES, & ENDS: SIDEWAYS STORIES ON THE ART & SOUL OF SOCIAL WORK is is a collection of 99 stories, parables, poetry, and other writings on life as a social worker. It contains wit and wisdom about the profession that you will not find in a traditional textbook. As author Ogden Rogers says in the book's preface, "If they provoke a smile, or a tear, or a critical question, it’s worth it." I hope you'll consider putting this book on your holiday and graduation wish list! The Fall 2013 issue is hot off the press! We have so much great material that we increased this issue from 32 pages to 36! Highlights include building resilience for new social workers, a response to the DSM-5, individual and group supervision, public housing, mandated reporting (parts IV), social work at the movies, family technology assessments, poetry, book reviews, and more! We also are featuring an audio feature -- a very powerful poem by social worker Mozart Guerrier! Download it here (free download)! Purchase it in print here! Purchase the full 2013 volume here (all 4 issues from 2013 in one volume)! Did you know that when you read THE NEW SOCIAL WORKER in PDF format on your computer, you can click through to items as you read about them? Many URLs and e-mail addresses throughout the magazine are clickable. Give it a try! 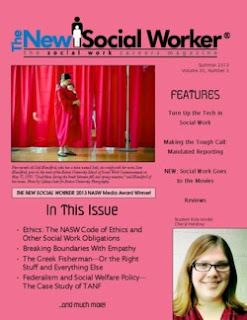 Articles from this issue are also available on our Web site (http://www.socialworker.com) in Web format. ...and much more! The above is just a sample of the content of the Fall issue. Visit our website for the full list of online articles and to download the full issue! Share your knowledge and experience with other upcoming social workers! I am seeking articles for our “What Every New Social Worker Needs To Know…” column. Also, I am always looking for interesting and educational articles in the areas of field placement issues, social work careers, and other topics of interest to new social workers. Feature articles typically run 1,000-1,500 words in length and are written in a conversational, entertaining, and educational style. Write as if you are having a conversation with students or new social workers about something they need to know to enhance their social work career. If you have an article idea, please e-mail me with your idea or complete manuscript. I hope you enjoy this issue of THE NEW SOCIAL WORKER. Please let your colleagues, classmates, and/or students know about THE NEW SOCIAL WORKER, and the fact that it is a FREE social work resource. Feel free to pass along the download links above, and let them know that they can subscribe free to receive notifications of future issues. If you have received this message as a forwarded message from a friend or colleague, you can subscribe at our subscription page. 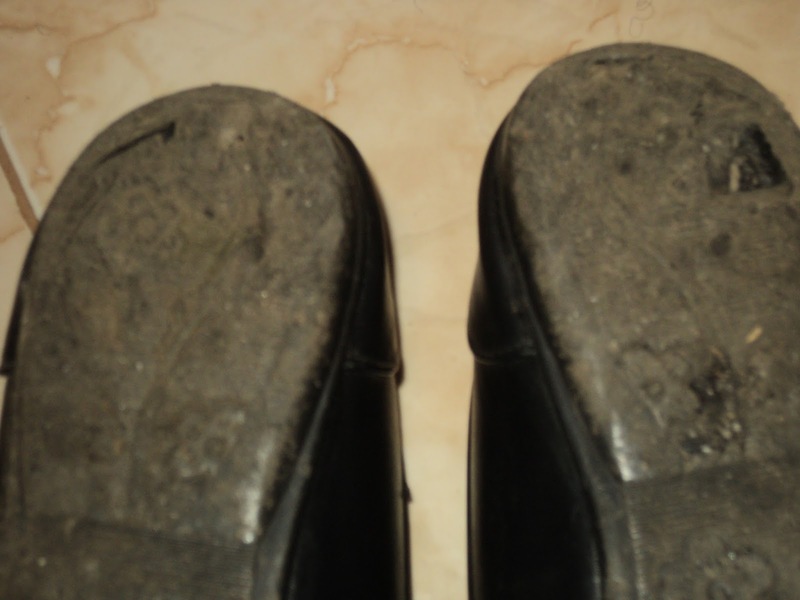 I look at my shoes worn, holes and all, and I am amazed at my journey. I have travelled for five years, and my journey is almost at an end. Two more weeks have passed on my practicum site, and I am getting there. I am almost at the point where I am comfortable in my own skin, with my colleagues, with the people who come to me for assistance!! Isn’t that something? God has been good to me! 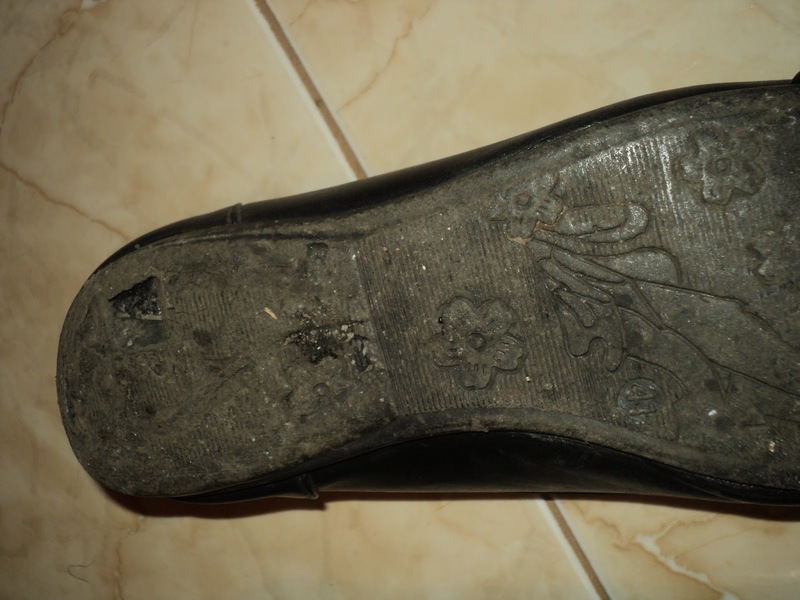 I look at shoes, worn out and ugly, and I smile!! Shoes symbolic of progress, and I am proud of the immense growth I’ve experienced. I astonish myself sometimes at how I quickly acclimate to a new task after hearing instructions once. One thing I love about this experience is the opportunity my supervisor has given me to "feel out" each aspect of the job. I have worked with children in our institutions, and I was also given the chance to work with Adoption and Supervision Order (S.O) cases. So far, it has been super awesome, but it wouldn’t be a true report if I did not reveal that the paperwork is immense and sometimes overwhelming. Progress is a must, so I refuse to let z paper defeat me! I look at shoes that walk me into newness of thinking. 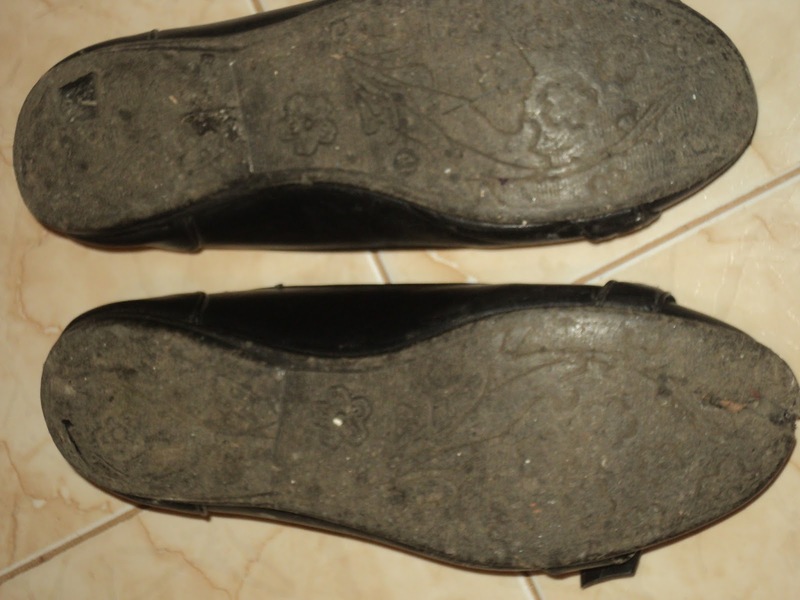 I look at shoes that hold my feet as I step into an exciting future. I am excited by the support and words of affirmation that my coworkers speak into my life. The colleagues to whom I am assigned have been very consistent in mentoring me and modeling the skills and competencies I will need to do my job effectively. 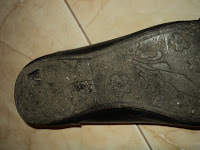 I look at shoes and I venture into the unknown; nervously-confident, anxiously-secure. The last two weeks were a buzz of activity. I was assigned my new cases, and in one day we did three (3) School Visits and four (4) Home Visits. Then we made it back to the office to prepare for a Child Care and Protection Act (CCPA) Quiz that our office was spearheading. It is exciting the immense wealth of knowledge that I am gaining and the new forms I’ve been exposed including but not limited to the Special Assistance Request Form and Form of Irrevocable consent. I am walking past my fear and nervousness. 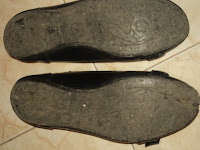 I smile as my shoes filled with holes strain out the anxiety I feel when I am about to enter a counseling session. 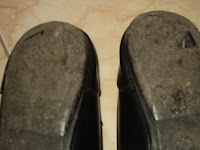 Shoes filled with holes strain out intimidation I feel when I talk to my supervisor or a colleague and I smile!!! I must admit that over the last two weeks I have surprised myself as to how much I have grown. I marvel at how composed I now am when I talk to a client, I make little jokes, listen attentively, and offer my suggestions. I step into my God-given Potential. One of my learning goals was to say yes to the opportunities that arise for me to display my talent and creativity, and I have done just that. I said yes when my supervisor invited me to do a presentation in Clarendon. I said yes when I was asked to do devotion at the CCPA Quiz. I said yes when I was asked to do devotions, a song, and my dub poem at the parenting seminar put on by the agency. I said YES and it felt so good, and as a result, I have resolved to continue doing so. And so the trod continues...2013 and beyond!!! Shanniel Shakespeare is a Spoken Word Artiste/Dub Poet. She is also a Child and Youth Advocate. 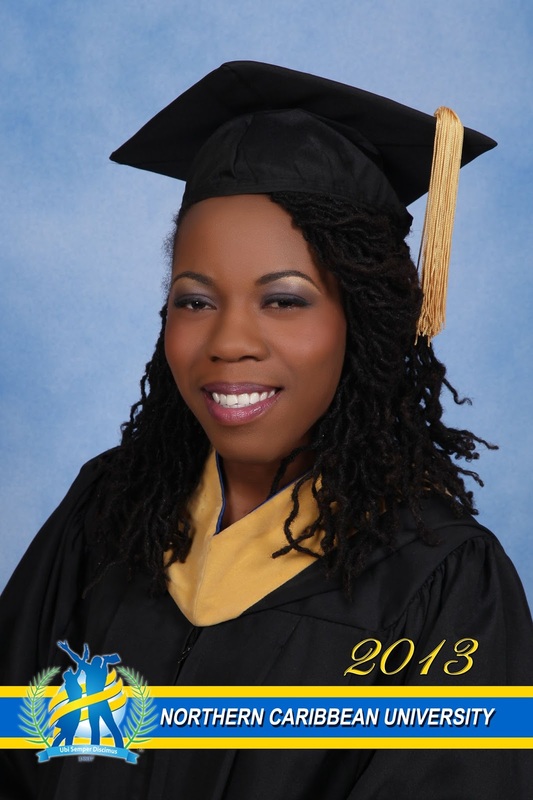 She has a first degree in social work from Northern Caribbean University. She also is committed to using her God-given talents, creativity, and potential to empower young people to live passionate lives. Quick! Name three celebrities who have adopted a child in the last decade. Easy, right? I thought of Angelina, Madonna, and Nia Vardalos. I’m not sure why Angelina came to mind and not Brad, but, well, now I’ve thought of four. Why do we know this? Adoption stories are in our media; their growing presence suggests a growing audience for stories about adoption. Filmmakers see it. In the last few years, adoption has been featured in Despicable Me, Kung Fu Panda 2, Meet the Robinsons, The Odd Life of Timothy Green, Juno, What to Expect When You’re Expecting and Martian Child, among others. In a somewhat cyclical relationship, film is formed by public consciousness and, in turn, forms public consciousness. Filmmakers give audiences what they want (a story) rather than what might be more helpful (thoughtful, thorough information on adoption). People like feel-good stuff. On my “Adoption at the Movies” Facebook page, my two most popular posts were shared over a hundred times each – both of them were pictures with cute captions – easily-digestible, quickly-absorbable pills of heartwarming happiness. People like that stuff. Filmmakers are artists and business people; they’re not social workers or unbiased chroniclers of history, and so films sometimes paint unrealistically polarized pictures, drawing from fears and hopes rather than reality. Look at adoptions. Adoption is often shown as an uncomplicated process: In Despicable Me, villainous Gru adopts three girls after passing a very superficial screening interview. In Kung Fu Panda 2, Po wanders into a noodle shop and is quickly adopted by Mr. Ping. Cornelius Robinson waited in an orphanage; when the right family came along, they were able to just take him. In The Odd Life of Timothy Green, the kid just shoots up from the family’s garden. Just like that. Simple, quick, painless paths to parenthood. That’s what prospective adoptive parents often want, and sometimes expect. Simple. Quick. Painless. Some movies highlight fears that the process will be brutal. In Martian Child, the social workers monitoring Dennis’ adjustment to David’s home are intrusive, distant, and judgmental. The Greens undergo an interview with disinterested, scornful social workers. It’s uncomfortable and frightening, but that’s what prospective adoptive parents often fear. Demanding, insensitive social workers. Film provides an insight into public thought. Sure, adoptions aren’t actually as easy as movies make them look – but people wish (and maybe think) that they are. Social workers aren’t generally as callous and officious as movies portray us – but people fear (and maybe think) that we are. Movies provide some hints as to what your future clients might be thinking. Movies have a much broader appeal than training videos. People watch, absorb, connect with, and remember movies. Even when movies are inaccurate in their portrayals of important issues, they can aid conversation. Social workers can use familiar stories to illustrate processes (Juno found adoptive parents through an advertisement, met with them, processed her decision with friends and family, but ultimately made her own choice), or to introduce conversations on important topics (Kung Fu Panda 2 portrays the painful effects of keeping an adoptee’s history a secret from them). Films can also help families process their own grief. Families often find it difficult to confront their grief about infertility, but films like What to Expect When You’re Expecting and The Odd Life of Timothy Green show characters struggle with the emotional impact of infertility. Some prospective adopters who have gone through infertility treatments might be able to talk about the feelings that a character might have had before they’re able to talk directly about their own experience. Movies can help parents develop empathy for their kids. Parents without adoption experience might connect with Po as he wonders why his history was hidden from him, and might decide to be open with history to ensure that their child doesn’t have that struggle. Some movies get the important issues right. Timothy Green refuses to keep secrets. Mr. Ping eventually tells Po the history of his adoption. The infertile couple in What to Expect process their grief and move into what seems likely to be a healthy adoption. With a social worker’s insight, Netflix becomes a powerful resource. What films have you seen that can help you better understand, engage, and serve your clients? Addison Cooper, LCSW, is the movie columnist for THE NEW SOCIAL WORKER magazine. See his first column, "Does This Movie Make My Attitude Look Big?" He also operates the adoption movie review website, “Adoption at the Movies” at www.adoptionlcsw.com. He worked as a foster care/adoption social worker in Southern California for seven years, and is now a therapist in private practice in Springfield, Missouri. Find him on Twitter @AddisonCooper. Summer 2013 issue of THE NEW SOCIAL WORKER is available now! The Summer 2013 issue of The New Social Worker magazine is now ready to download! It is available, free of charge, in PDF format, directly from The New Social Worker Web site. Or you can buy The New Social Worker in print. I am happy to announce that in the Summer 2013 issue, we are starting another fun new column in The New Social Worker! Social Work Goes to the Movies is the latest addition to our regular line-up. It is written by Addison Cooper, LCSW. Addison blogs about adoption in the movies and will be bringing his insight into all things social work on the big screen to our pages! We are still so thankful to all of our fans who voted for THE NEW SOCIAL WORKER magazine and SaraKay Smullens' article on burnout and self care in the social work profession for the 2013 NASW Media Award for Magazine/Magazine Article! It was such an honor to be chosen for this recognition along with all the other winners. The Summer 2013 issue is hot off the press! Highlights include the NASW Code of Ethics and social work obligations, what students need from their field supervisors, breaking boundaries with empathy, ER social work, a first group work experience, becoming a therapist, mandated reporting (parts II and III), social work at the movies, federalism and social welfare policy, Internet as a career killer, poetry, book reviews, and more! Purchase the full 2012 volume here (all 4 issues from 2012 in one volume)! Did you know that when you read THE NEW SOCIAL WORKER in PDF format on your computer, you can click through to items as you read about them? Most URLs and e-mail addresses throughout the magazine are clickable. Give it a try! 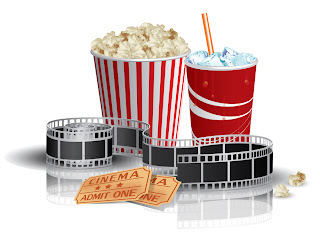 Social Work Goes to the Movies: Does This Movie Make My Attitude Look Big?